The road continues and we go with it. The same strip of pavement. The same trucks. The same shoulder. The same us. The road cuts through a town too small for my map. A few scattered houses. A gas station. A cafe. People buzz about. Drivers fill tanks. Truckers stop for a morning coffee. Locals catch up with each other in the cafe parking lot. We pass them with a smile and head through the front door. The day is already heating up and we need water. Daya heads to the restroom while I order coffee and peer into the case of baked goods until I find the rows of pastel de natas, Portugal’s signature pastry. A cheerful woman slides one on a plate for me next to my coffee. The custard filling is still warm from the oven. The crust is flaky. It is gone in three bites. Daya comes back, her water bottle full. “You want anything?” I ask. She shakes her head and I down the rest of the coffee. It was a token purchase. We really came for the water. I pay and head to the bathroom sink to fill my water bottles. We put on our packs and head out the side door, back to the road, to the pavement, to the shoulder. 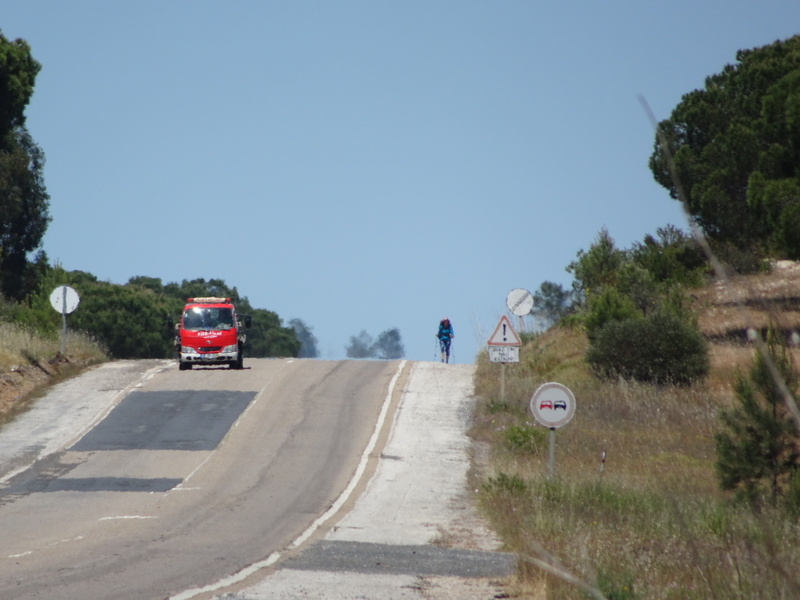 I think of the line of steps leading backwards on the asphalt, back to the bridge over the Tejo River, back farther, to Fatima and Santiago, to France, Italy, and the Alps, back all the way to Kinnarodden. I keep walking, a grin on my face as cars race by while I think about this line, a scribble all my own across a continent that now goes in the front door of that cafe, stops for a moment at the pastry counter, then walks out the side door and onward toward the south. It’s no perfect line, but it’s mine. Posted in Europe North to SouthTagged ENS, Europe North to South, featured, PortugalBookmark the permalink. Do not flip a coin at the end of this journey! Yes. Each day is exactly as it was meant to be. Namaste. I often wonder what the tracks of my life would look like from above!